My original intention wasn’t to visit all the places I researched in my original post. I planned to find one that was close, with a convenient schedule and just go there like I’ve done in Panama and Boston. Since I was working during the days and had some social events in the evenings, I had all the schedules at the ready and ended up going wherever had a class scheduled whenever I found myself with a free moment. Turned out that those all ended up being at different places. I have mixed feelings about this approach; I liked spending more time at a single place. You get a change to know the people there better and they get to do the same. Though, with my limited schedule I glad to visit as many different places as I did. It’s always fresh, new and exciting. So, there’s a trade off. I was staying in Palemo Soho near Darregueyra and Guatemala, so all the travel times are based on that. Your results may vary. 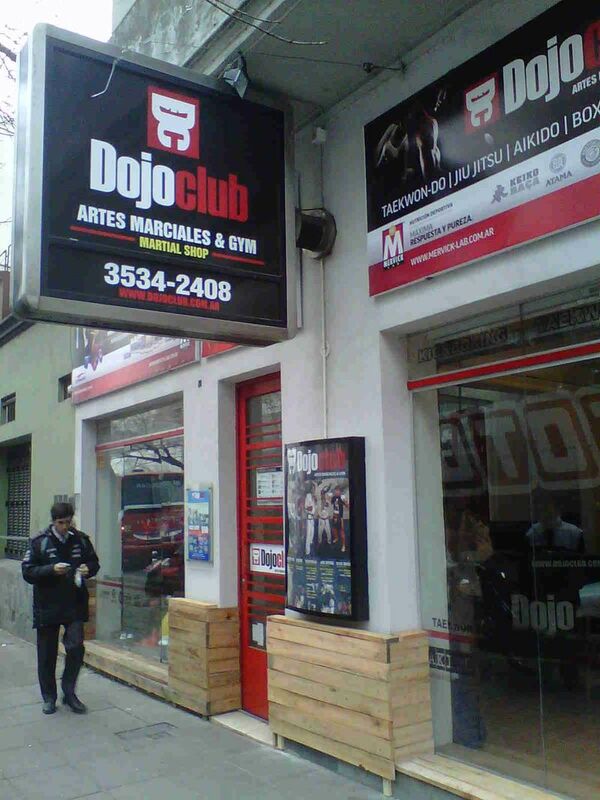 On a side note, Buenos Aires seems to attract a lot of BJJ players from abroad. I saw a guy with a Roger Gracie shirt in Puerto Madera and another with a Royce Gracie/TeamRoc shirt in a cafe near my apartment in Palermo Soho. In fact, at 2 of the 3 gyms I visited, I ran into fellow New Yorkers. 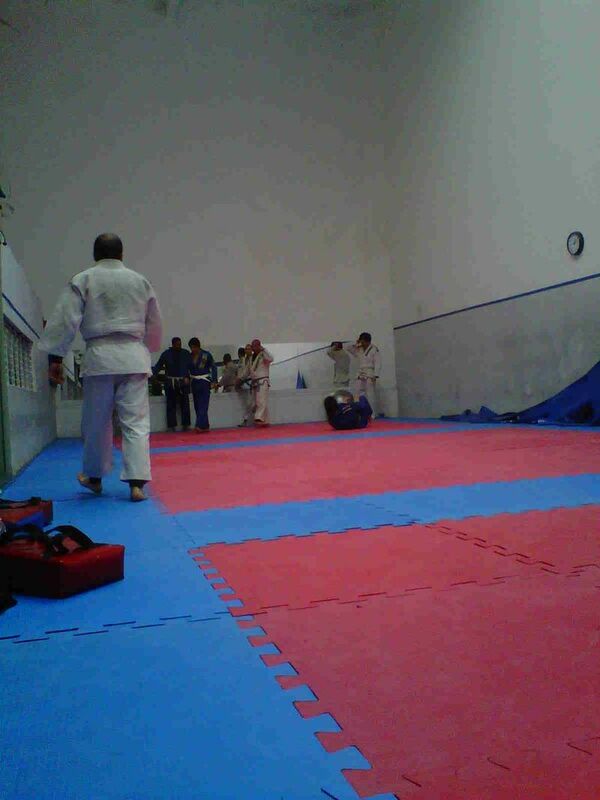 On my first Saturday, only Sukata and Pitbull had classes and I ended up at Sukata. 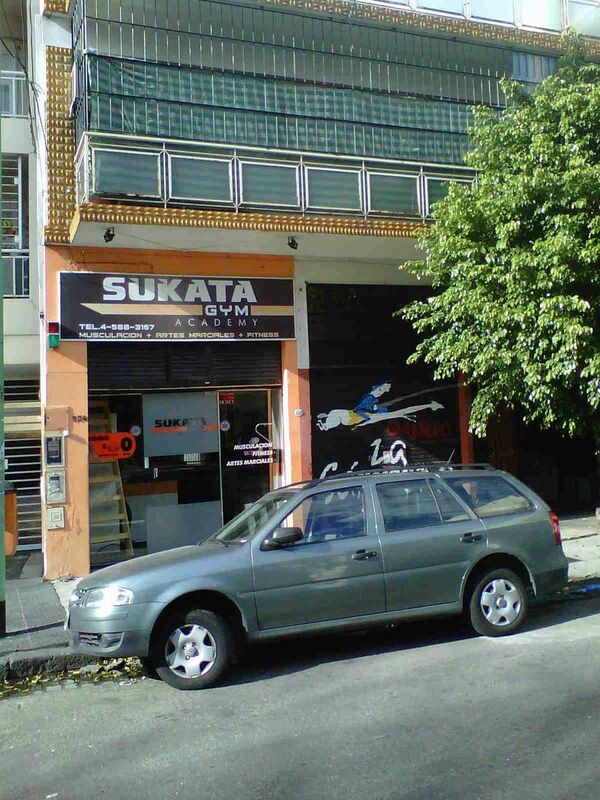 On a quiet Saturday morning, Sukata is about a 15 minute ($20 AR) cab and 50 minute walk from Palermo Soho. 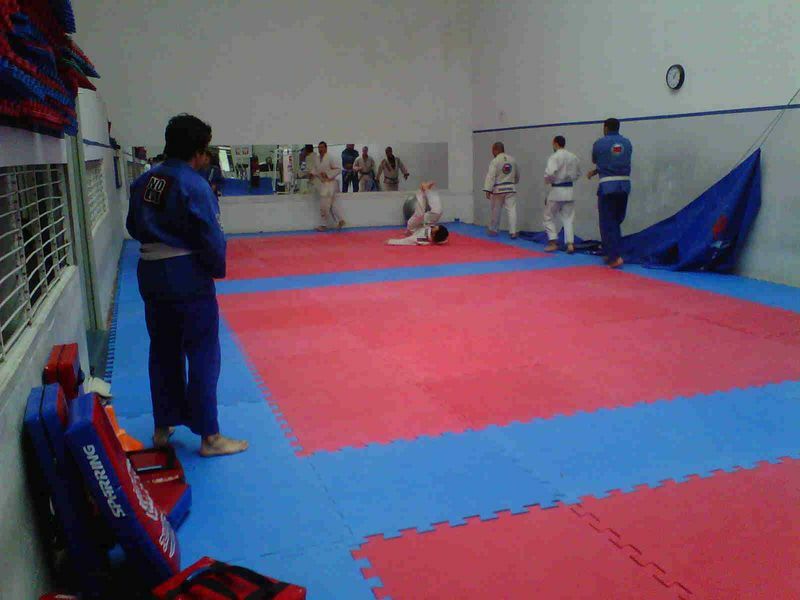 I attended the 10:30am beginners GI class. 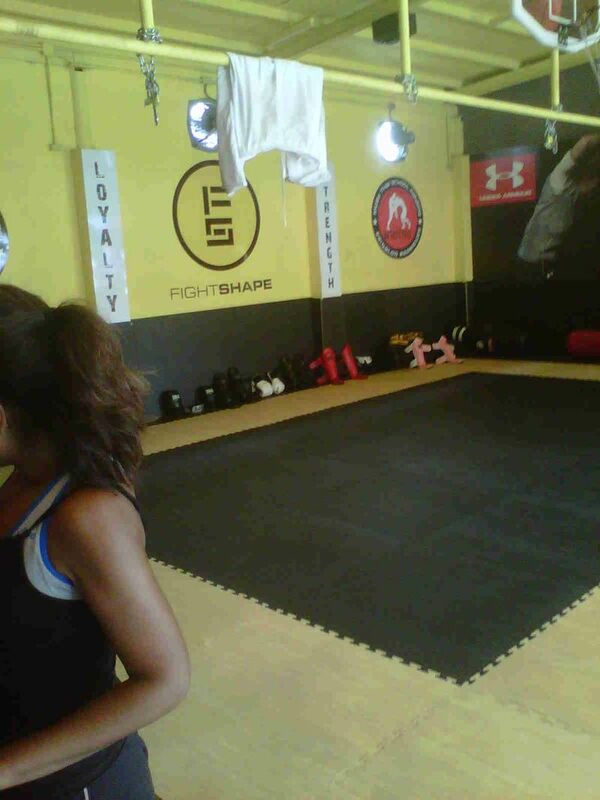 The gym is a small storefront with a basic fitness/free weights area in front and a small room for BJJ in the back. No fancy zebra mats here; just a tarp stretched out over the type of thin rubber tiles you see in a weight room. Made a mental note not to get caught in any Judo throws. 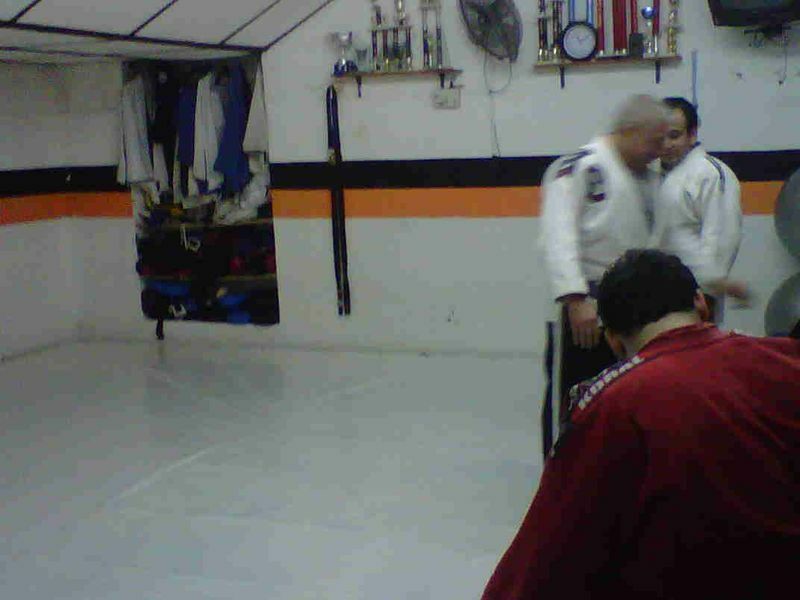 The instructor was purple belt whose name I didn’t didn’t catch (Perhaps Luis?). He didn’t speak any English and neither did anyone else in the class of about 10 white and blue belts. No preocupes. Yo hablo spanglish. Plus, arm bar needs no translation. He showed two arm bar escapes that I really liked, a novel side control escape, and a kneebar sub from within half guard that has since become my secret half-guard killer. I do recall thinking whites belts and kneebars are usually a recipe for disaster. Then he busted out a spider guard sweep to a calf slicer. Now I’m thinking, someone here’s going home with a torn ACL and it ain’t gonna be me. We started rolling to a round timer that sounded like a school bell. I kept feeling that panic about being late for something every time it went off. I was told that weekday mornings are the advanced belts. Unfortunately my schedule didn’t allow for that. Plus, if I’m fighting black belts I want my A game. At 8 am, I’m still working on my Zzz game. 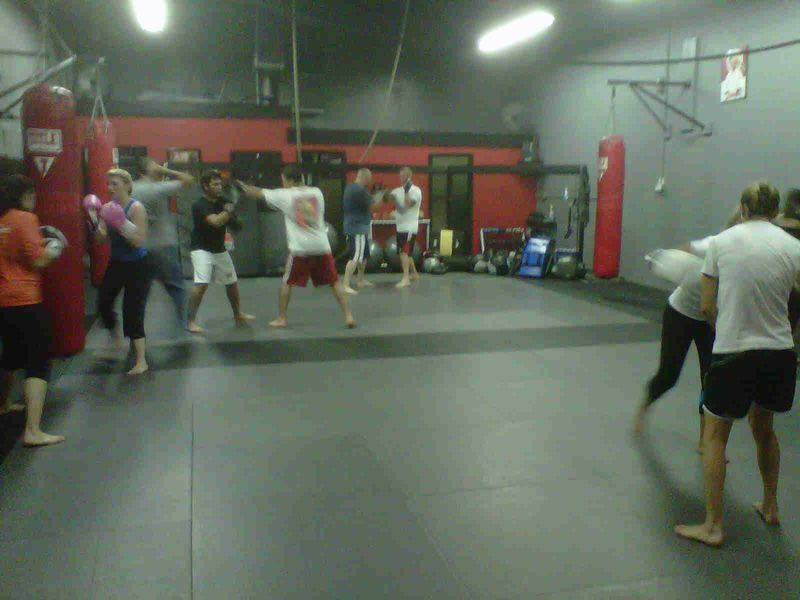 Freddy Sukata teaches the Tuesday evening class. $30 peso mat fee. Gym has showers and a locker room. 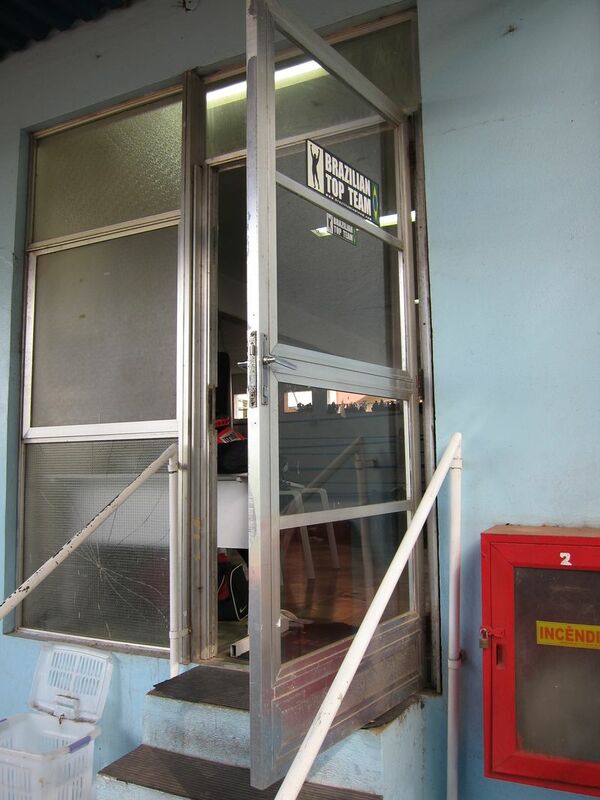 Most of the gyms in Buenos Aires have evening classes starting at 8pm (20:00) or even 9pm (21:00). On Monday, I had a late dinner scheduled so, I needed an earlier class. 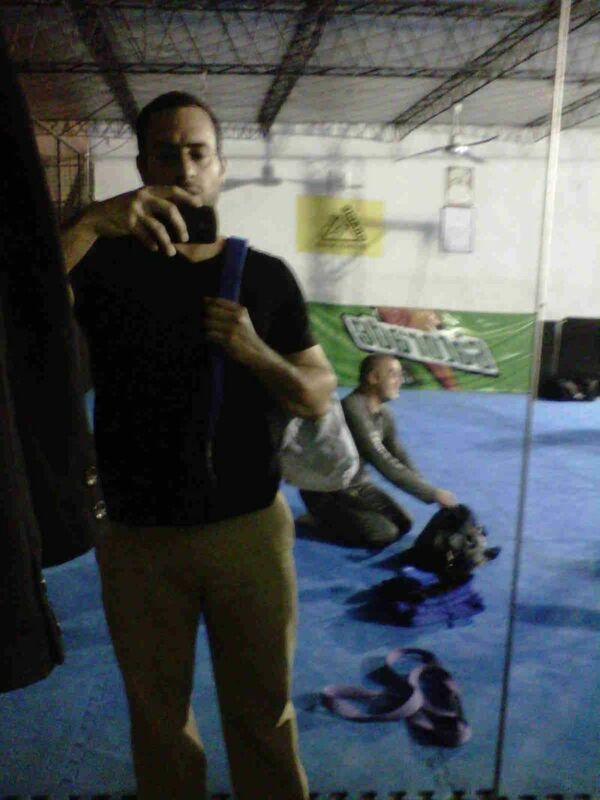 The Gracie Academia at Club Flex had a beginners class at 7pm and advanced at 8:30(ish) so I went there. It was a bit hard to find. There’s a single dark doorway with a staircase leading right up to the gym on the second floor. I must have walked past it about three times. The class is held on the ‘third floor’ which I suspect was once the roof now covered with a thin ceiling supported by scaffolding. This was winter in Buenos Aires and it was about 35 degrees Celsius outside. So, while I appreciated the homage to the open air gyms of Brazil, I secretly wished I could wear socks and not look like a fool. The instructor, Sebastian, spoke English fluently and was great at making sure I was following everything. In the beginner class, I met a fellow New Yorker from the Upper East Side who was a university student doing a semester abroad. 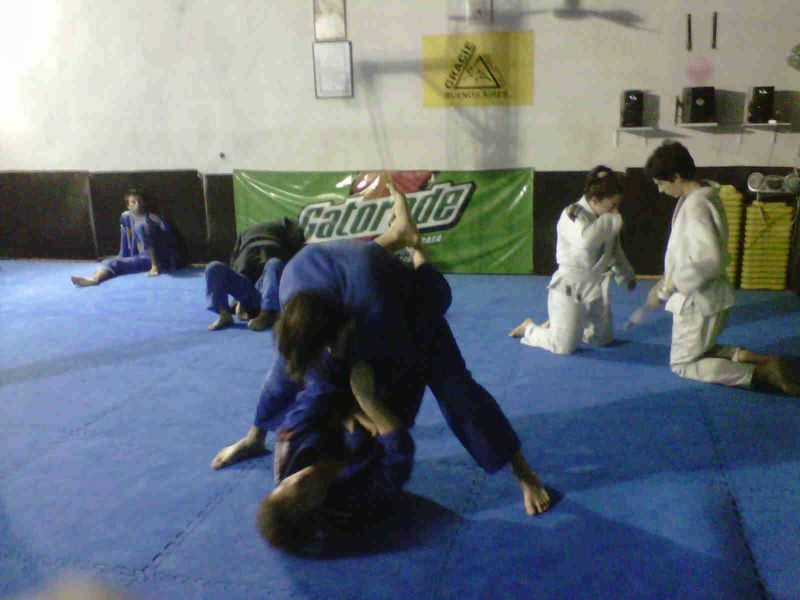 The beginner class had about 20 people but, for the advanced class that dropped to about 7; blues and purples only. 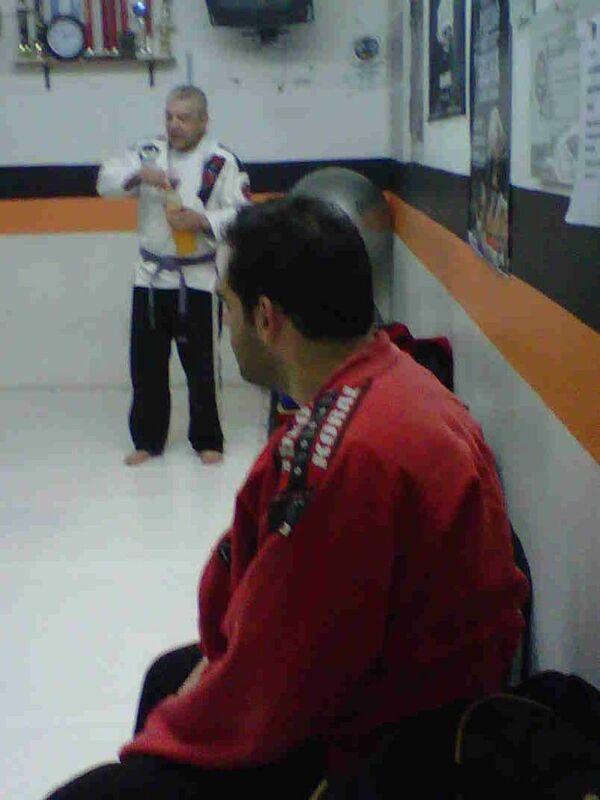 That day there happened to be a black belt from Brazil visting BA on business. 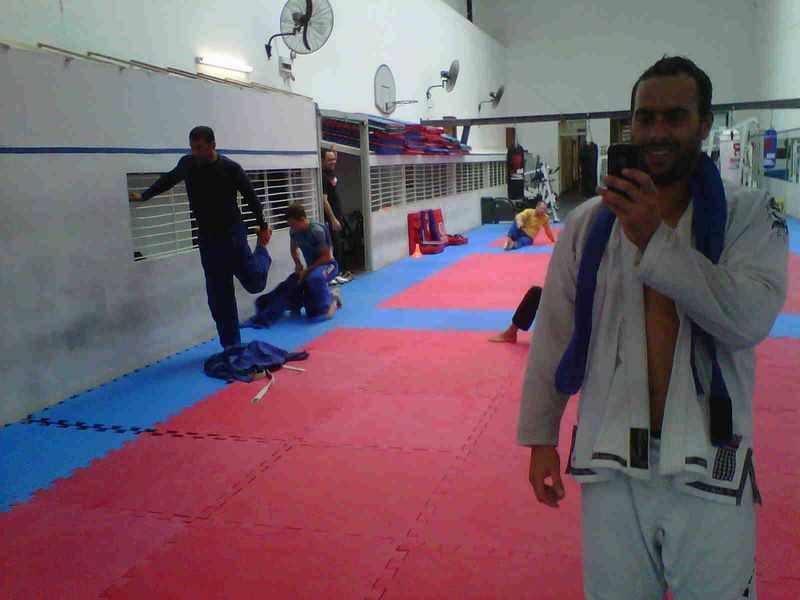 He was invited to teach the class and taught some interesting sweeps from half guard. 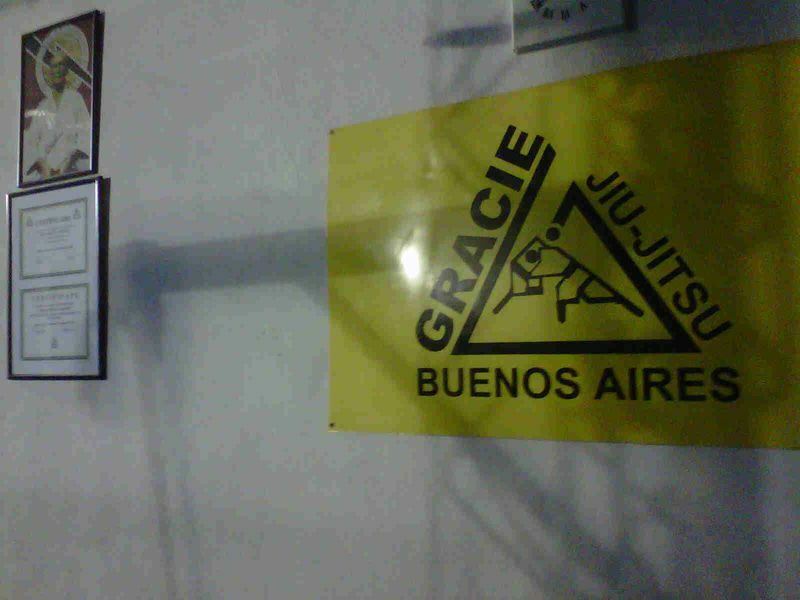 Gracie Academia is about a 15 minutes cab ride from Palermo Soho; $20 peso. No locker rooms or showers that I saw. On Wednesday, I ran over to Dudu Duarte during a 1 pm lunch break. Based on the Google map I put together of all the gym locations, I thought it was much further, but it ended up being closer than the previous two. That’s because taxis can go across on Av. Cordoba much quicker than through the local streets. It only cost $10 pesos and was 10 minute cab ride. This was the largest of the gyms I visited with a more modern fitness/free weight in the front and a very sizable mat area in back. It also had really high ceilings and large windows, which made me feel like I was training in a cathedral. For a midday class, there was a rather large group of whites and blues. Included in the mix were a few foreigners; two Australians and another New Yorker, this one from the Upper West Side. 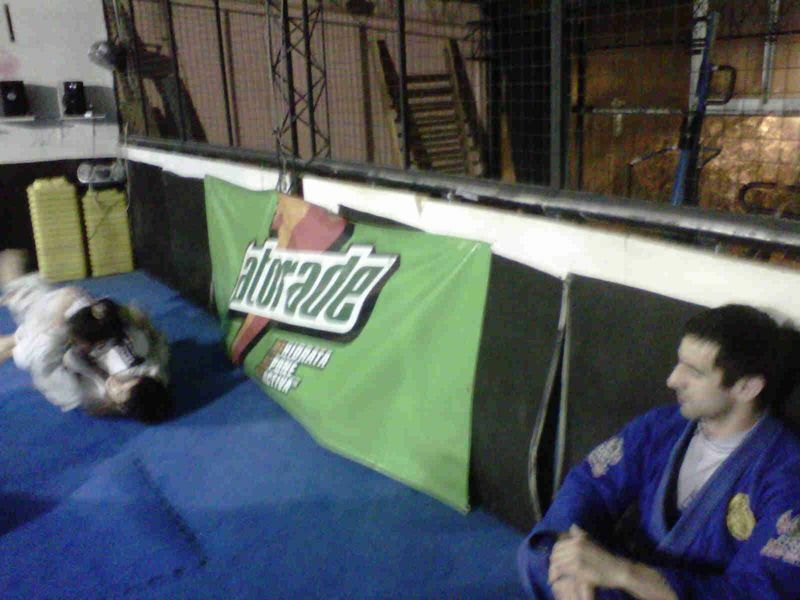 Head instructor, Dudu Duarte, taught the class. He also spoke English and mentioned that he had lived in the US for a substantial length of time. He was a really nice guy and had a good approach to breaking down a move into its individual components. He showed us a transition from an abandoned arm bar to a single leg takedown involving a backward roll that at first glance looked complex but ended up being surprisingly simple and effective. Following class, we rolled. After about 10 fights or so I was exhausted and started getting ready to leave. Of course, this is always when someone asks you to roll. You hesitate for a brief moment while the little angel on your left shoulder says, ‘You’re tired and should call it a day.’ and the devil on your right shoulder say ‘Put on your big girl pants and do it!’ It didn’t help that it was a young woman in her late teens who asked. Even though she was a purple belt, I probably outwieghed her by 70 pounds. Ok, one last easy roll. Mistake. I started off slow and she started off like a starving mongoose attacking a baby cobra. She went knee on belly and, before I could react, spun me into a baseball choke that caught my chin and almost snapped my head clear off my shoulders. Let’s call this one a learning moment … and I got the hell learned outta me. The gym has a locker room with showers. I don’t recall being charged a mat fee. For the second half of trip, my wife and I went to Cordoba for the weekend and then San Juan, where she was delivering a presentation at Argentina’s national HIV conference. 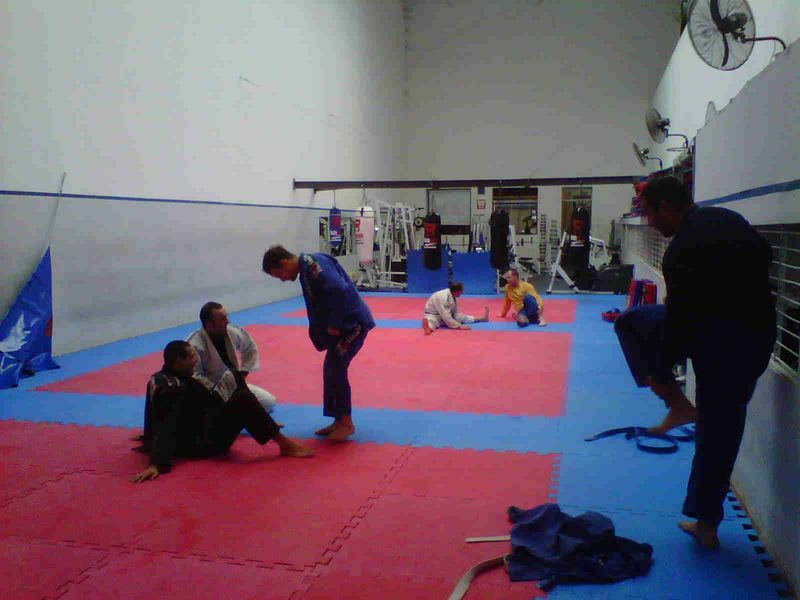 Cordoba has some BJJ gyms, but I hadn’t been there before and wanted to leave my days for sightseeing. San Juan is a much smaller city with less to see, which left me with some time on my hands. Unfortunately, Google turned up nothing and after a fairly extensive (my wife said obsessive) search around the city, I’m pretty certain there weren’t any BJJ schools there. If you know of any, please add them to the comments below. If you practice JiuJitsu for a while, one of the most common questions you’re likely to get is “Why?” — second only to “Is that like Karate?” Since I don’t have any visible tatoos, I’m over 35, and don’t wear Ed Hardy regularly, this question is usually accompanied by a look and tone that implies that up until that point they thought I was normal, but now am something akin to a strange dog that may or may not be rabid. Recently, I was asked this during a conversation with a group of collegues after one of them had just finished telling us how they were training for a marathon. Now, they didn’t ask him ‘why’ with furrowed brows and winces. In my opinion, willingly running 26 miles is an equally ‘abnormal’ activity that appeals to only a small subset of the general population. So, why does telling people about training for a marathon elicit, “Wow” and “That’s great.” but training for a JuiJitsu competiton gets, “Really?” and “Is that like Karate?”. I’ve read a few books and articles that philosophize on ‘Why fighters fight?” . I read Sam Sheridan’s, A Fighter’s Heart: One Man’s Journey Through the World of Fighting a while ago. (See my ‘review’). I like his term Gameness – the willingness to push oneself and test the limits of your ability. In a fight, your opponent is trying to reduce that willingness while maintaining his own. It’s a nice theory but not specific to fighting in my opinion — I would imagine that in a marathon your Gameness is similarly eroded by your ‘opponents’; time and distance. In her column, Bitchslap: A Column About Women and Fighting, Susan Schorn puts a feminine and a much more humorous slant on her response to this question during a visit to the emergency room. I guess I’m lucky that when I tell people I fight that they’re only suspcious about my sanity rather than my sanity and which team I’m playing for. In the same internet publication, Rory Douglas’ column, Notes From an Amateur Specator at Amatuer Mixed Martial Arts, starts with an article that pokes fun at the inabilty of fighters to articulate their reason for fighting. Now perhaps its unfair expect people to articulate their rationale for doing an activity that they enjoy, when that rationale is best expressed by their performance. They are articulate during that expression in a way that doesn’t necessarily translate into other forms of expression. You wouldn’t ask a writer to express his love for writing in an interpretive dance. Maybe that’s why a lot of interviews with athletes, singers, actors, and even writers can end up sounding like a beauty queen postulating on maps and such. It’s probably why you’re scratching your head as you read this. Given how frequently I get this question, I should probably have a ready elevator pitch. Instead, I gave the group my rationale on why I like fighting in the context of why it’s preferable alternative to a marathon. There you have it. I like to win. I’m not Kenyan. So if I’m putting in the long hours and risking injury, MMA offers an overall greater potential return on my investment. While I write this, I’m waiting for a flight to Boston (might try Fenix Fight Club, since I’ll be stuck in Burlington, Mass without a rental car) and planning a trip to Argentina in a few weeks (just starting my research there). So, before I’m off on these next adventures, I wanted to get down my wonderful experience in Panama for anyone else who may want to follow in my footsteps. 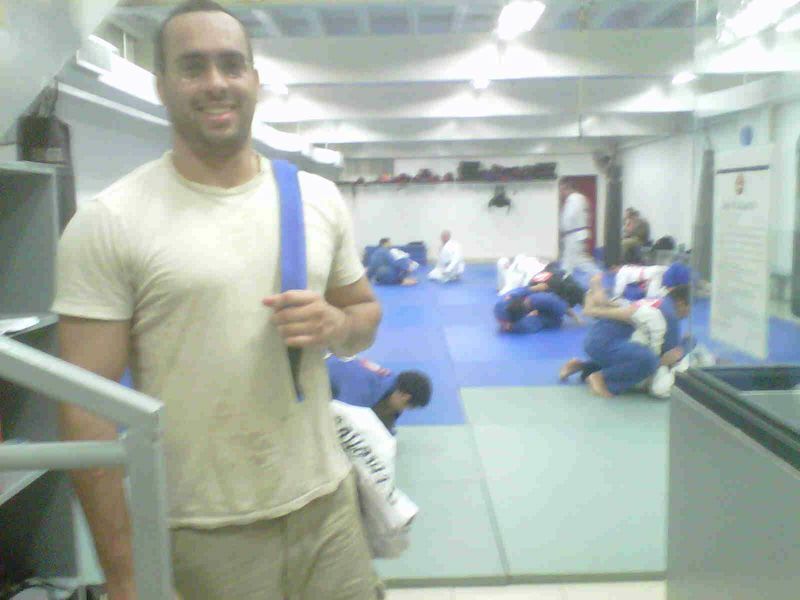 In my last post, I talked about my plans to train Jiujitsu while in Panama for a wedding. The first thing I did was check out Christian Graugart’s BJJGlobetrotter blog for posts on his time in Panama. 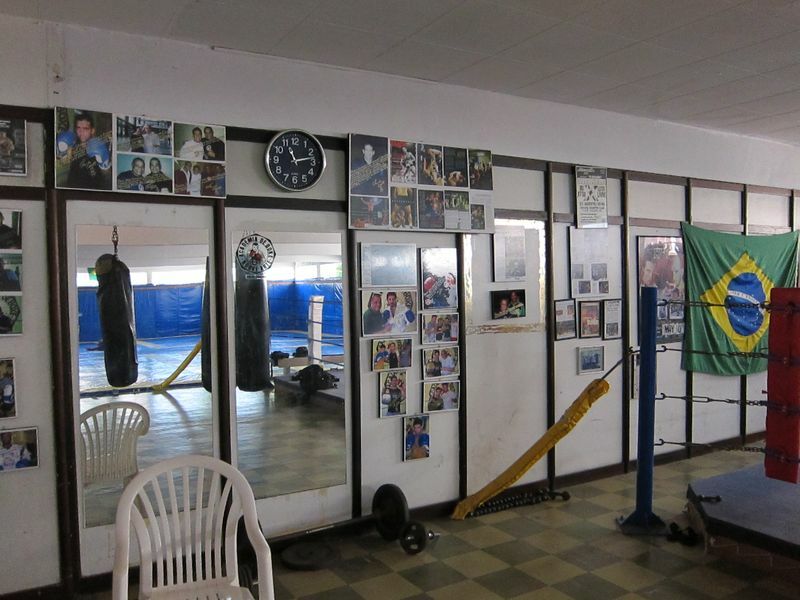 He mentions three gyms — Fightshape, Gracie Barra Panama, and Spartan — but doesn’t provide much detail on the actual locations. Some Googling turned up Facebook pages and addresses for all three, but this wasn’t the end of the search. Apparently, Panama hasn’t gotten around to numbering buildings. This fact, combined with the rapid rate of new construction and changes to street names, makes Google maps next to useless in locating places. 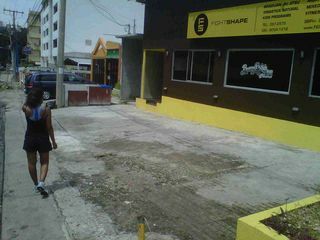 I’ve put together the map below to give you a more exact location on Fightshape and Gracie Barra Panama. (Update 7/30/11 – added approximate marker for Spartan) Generally, addresses are given in context of some local landmark like a store or shopping mall. (Panamanians love their shopping malls.) Panama’s not the most pedestrian-friendly city, either. Fortunately, taxis are plentiful and cheap — $3 to $5 for most trips. (If it’s more you’re getting the Gringo Tax.) I used Radio Taxi, 221-1932. Once I found Fightshape I had planned to just cab it back there for the evening classes. 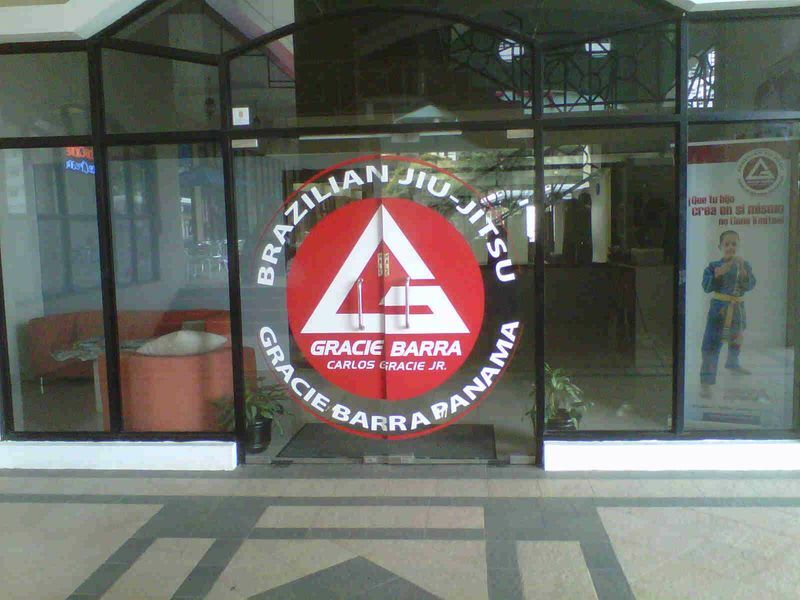 All I knew about the Gracie Barra Panama was that it was near a Dunkin Donuts and a Super 99, but not being a local that didn’t give me a lot of information to go on. In an amazing example of BJJ karma, I mentioned this to the groom. He takes me to the balcony of the apartment I was renting and points at the back of a building across the street and tells me that it is the Super 99 (which is a popular supermarket). This was great because I could just walk there — even though this involved walking near a shanty town, over an ditch, up a steep embankment and across a highway overpass. Did I mention that Panama isn’t pedestrian-friendly? Hands down, this is the best experience I’ve had visiting a gym thus far. I ended up going each of the three days I was in Panama City. Hector Vasquez, the owner, was very warm and welcoming from the onset and I found everyone else there to be the same. Each of the instructors spoke English fluently and were really great about making sure I was following everything. While my Spanish is decent, I found that very thoughtful of them. There was a true family atmosphere. The children’s class was just before the adult’s. I got a real kick watching one of the instructors ‘roll’ with an adorably precocious four year old girl who laughed hysterically each time she got swept. 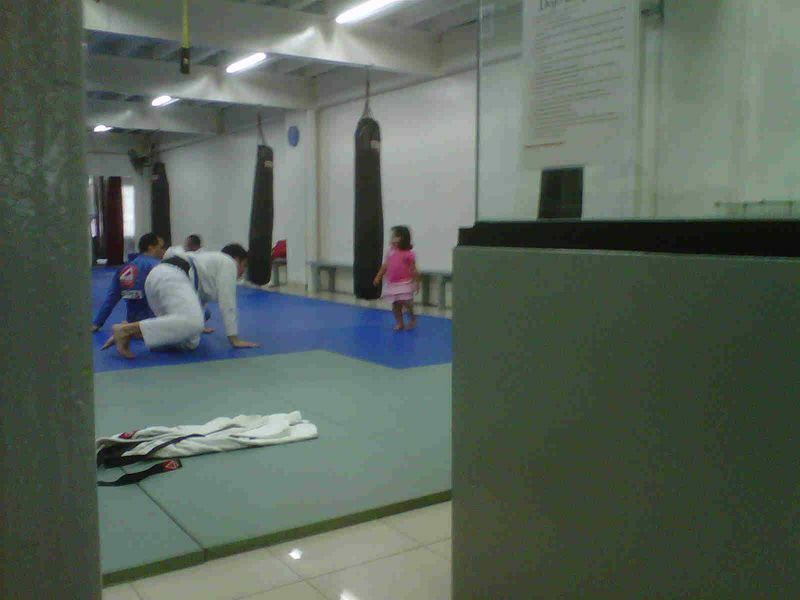 (see the picture below) I suspect she was somebody’s daughter, because she was a fairly permanent fixture on the mat. So while she’s cute now, she’ll probably be a certified assassin by the time I get back there. All the guys closer to my weight class were also very cool. When I was saying my goodbyes, I was told that this was now “my house” and I was welcome back any time. You can’t beat that. 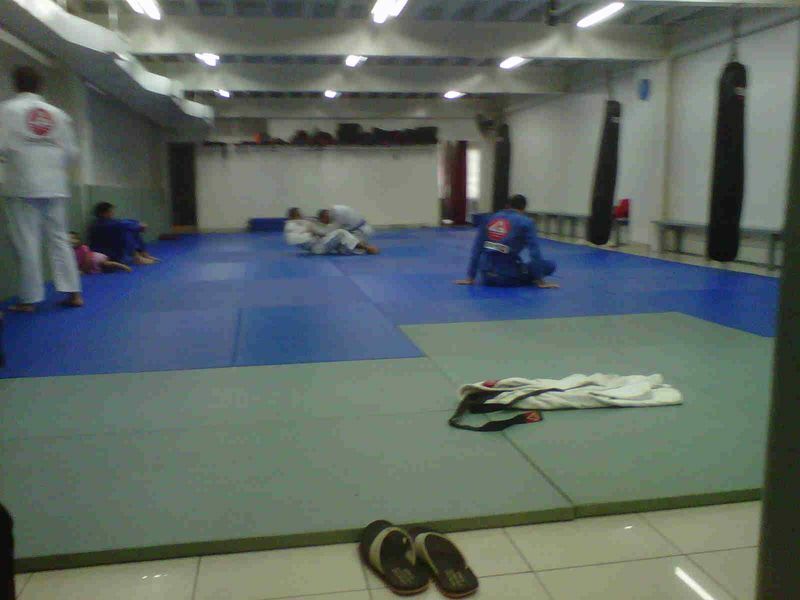 Gracie Barra has a really nice two-level space complete with A/C. 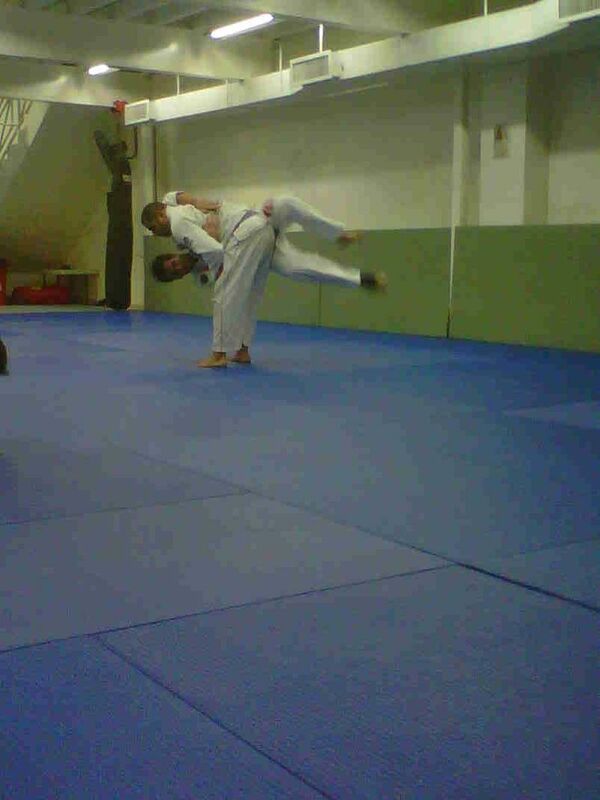 Adult BJJ classes are every weeknight at 6:15, 7:15, and 8:15 except Fridays. Saturday classes start at 10am and open mat is at noon. (see full schedule) Mat fee was $10 per day. There’s a nice gym upstairs called Power Club Punta Pacifica that offers day passes if you want to lift. The closest I came to finding Spartan was seeing a bumper sticker on a Jeep in Casco Viejo. If anyone can provide a Google map link to a more exact location, please add it to the comments. 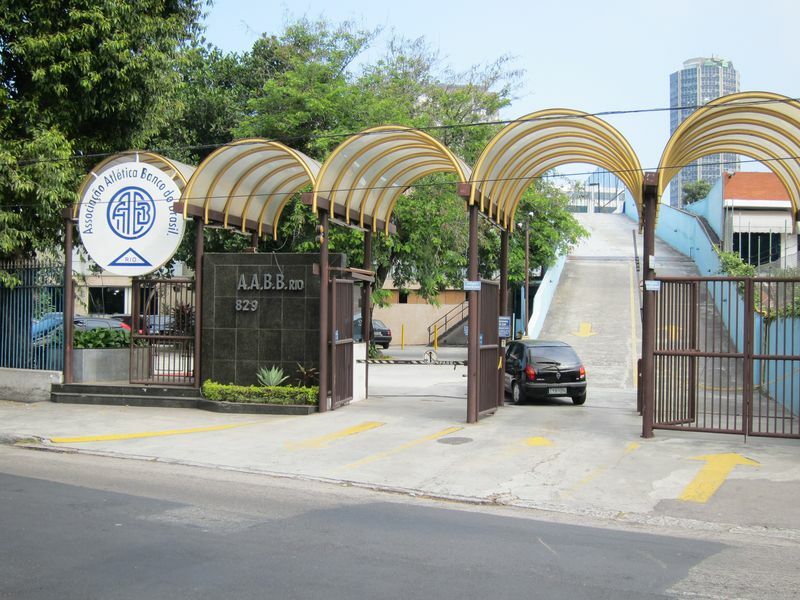 Update 7/30/11 – As per Miquel’s comments, Spartan is near Edificio Siglo XXI and Plaza Edison. This helped me add an approximate location marker for Spartan on the Google Map above.Thanks, Miguel. About a month ago, we hosted the famed BJJGlobetrotter, Christian Graugart, at Ronin Athletics for the New York portion of his 6 month trek around the world. At this point in time, Christian's been on the road for 113+ days, training jiu-jitsu through 20-odd countries. As someone who loves to travel, Christian's travelogue fills me with a mix of envy and wanderlust. Luckily, I do get to travel frequently for work and pleasure. So, my passport is satisfyingly well-worn. Only recently, though, have I started packing the Gi along with my suits and shorts. As any business traveler will tell you, work travel is not as glamorous as it sounds. As a rule of thumb, when someone says they are going to Boston, Chicago, or New York for work they are actually going to some corporate park 40 minutes outside of the city limits to spend 9+ hours in a conference rooms that looks the same as the one in your office. Case in point, I just got back from Abingdon, UK (40 minutes from Oxford) and my prior trip was to Burlington, Mass (40 minutes from Boston). What has made slaving for the man a little more tolerable is knowing that the man is subsidizing my Jiujitsu education. My induction into the Brotherhood of the Traveling Ripstop Pants, started last summer with a last minute trip to Rio (see the post). My wife and I found ourselves with a month and half free from work travel and a surplus of vacation days and airline miles. She saw it was Rio's low season and suggested that I train while she did her own sightseeing. (Did I mention she's also very attractive?) 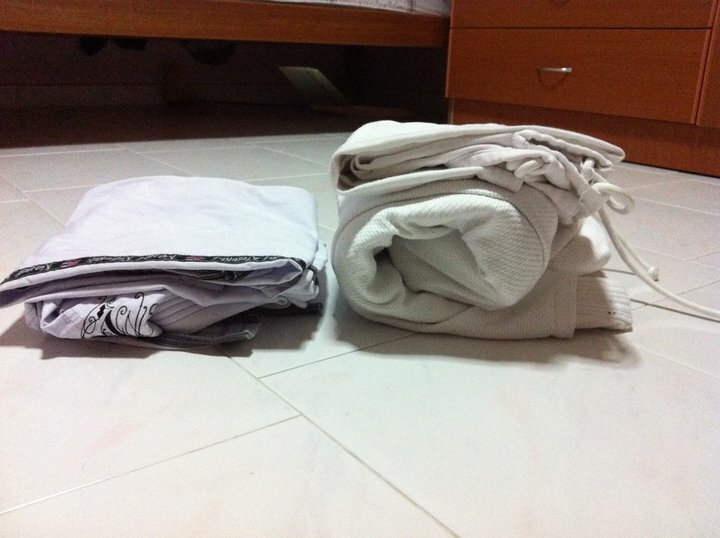 Ever since then, I've made sure to research local gyms and pack the Gi before any trip. I've practiced some other martial arts prior to Jiujitsu and I don't think I would have felt as comfortable just showing up at another dojo and asking to train with them for a few days. 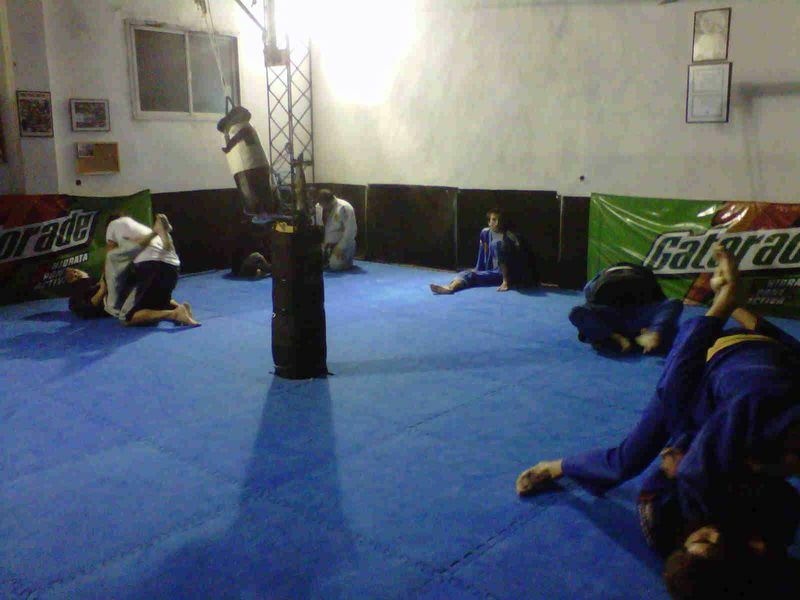 However at the various Jiujitsu schools I've dropped in on, I've felt nothing but welcomed. In my opinion, its in a school's best interest to introduce an unknown variable every now and again. Given how frequently I train with the guys (and gal) in my home gym, I know each of their games fairly well. I know who I can always beat, who can always beat me, who's a sucker for triangles and who's not. Plus, we're all attending the same classes so, we're to some degree all working with a similar set of techniques (YouTube aside). But when a stranger shows up, its all new. Maybe they're all spider guard or pressure passing. You find yourself defending against the unexpected and maybe using moves that you've long ago abandoned because they became predictable. This weekend I'll be in the Boston area and next week I'll be in Panama. 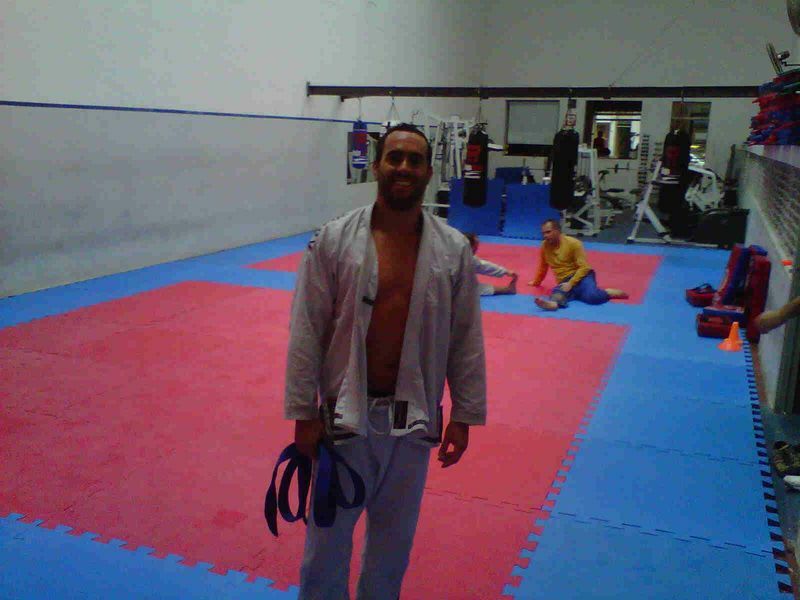 So as I make my plans and pack my Gi yet again I thought to send some postive digital karma to those gyms that have extended a warm welcome to this jiujitsu journeyman in the past. 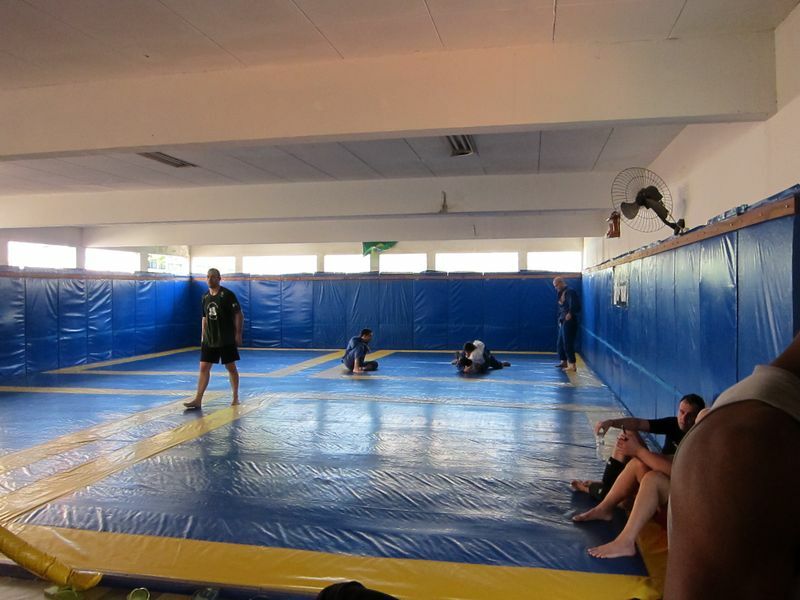 What can I say about training in Rio, the mecca of BJJ, that has not already been said? Save your airline miles, cash, and vacation days and just go. You will not regret it. Contact Fabiano and let him know I said hi. I had to travel to Seattle for work for a week and contacted Rodrigo Lopes to see if I could train with his guys while I was there. Not only did he say yes, he didn't charge me any mat fee for all of the days I went. Way cool. Great talent on the mat including a big Hawaiian white belt who tossed me all around and I later found out was a judo black belt. I went back for another week about a month later, and they had moved into a large new home just a 15 min taxi ride from downtown. These guys are great and I will certainly recommend checking them out if you're in the area. Again for work, I found myself in exciting Tampa. Recommendations from a few friends were to check out Hobson's place, but I actually had some trouble locating it on Google. I think he may have been changing locations at the time. 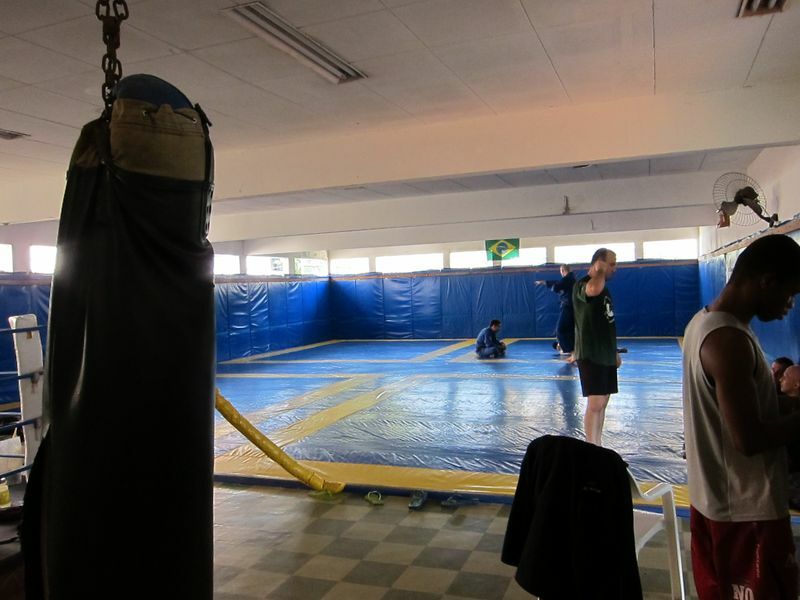 What added to the confusion was that the place he teaches at is called Martial Arts Advantage South (http://www.martialartsadvantage.com/contact-us) which is a dojo with other styles taught. He only has the address on his own website so, don't get lost looking for his name on a sign as I did. Mat fee was $25 per day. Ouch. More work travel, but being near Boston offered a huge selection of BJJ and MMA gyms to choose from. Kenny Florian's place was my choice for a number of reasons not least of which was that it was close and there was a snowstorm going on. I had heard that Ken's brother, Keith, generally teaches but, as luck would have it, it was Keith's birthday when I showed up. So he got the night off and I got a lesson from a UFC champ. BJJ Karma Win! Mat fee was $25 is now $30. Awww. BJJ Karma Fail. This brand new school wasn't open yet during my last two trips to the UK earlier this year, but I am glad I got to go on this last trip. This place is a fighter's dream. It's huge. As in has a separate area with half a dozen heavy bags, a full boxing ring, full cage, and a full gym on just the first floor huge. 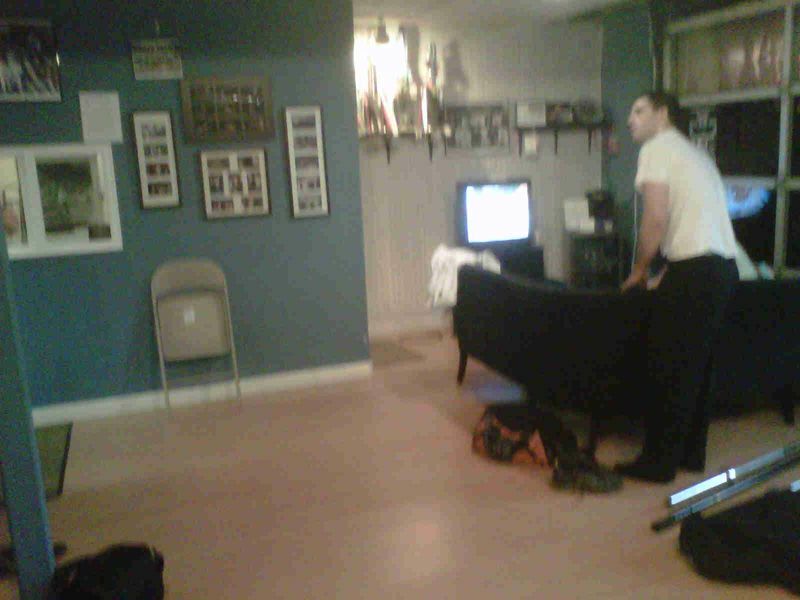 The second floor is all matted and is large enough to host a good sized tournament. For those of you in the 'burbs, this may not seem unusual but, those of us in large cities are amazed at gyms larger than a bread box. That goes double if they have windows. I only got to go twice and for bjj only — right after I got off my 6 hour flight (bad idea) and right before my return flight (equally bad idea) — but, they have classes for Muay Thai, MMA, Boxing, Wrestling, and more. It's like a University where you can get your PHD in Kicking A**. Best of all, no mat fee. I'll return to Florian's this weekend. As for next week in Panama, it'll be a toss up between several schools Christian listed on his site; Spartan, Gracie Barra, and Fightshape. More to follow. Postscript – On this last trip to Oxford, I got asked a lot about the lightweight Gi I was wearing. It was a recent purchase and I feel its a must-have travel Gi. It's the 100% Ripstop Gi from Kauai Kimonos. I had seen it before online when I was looking for a good travel Gi, but I was unsure about a ripstop jacket and had concerns about sizing since it can't be shrunk. (Went with the Shoyoroll Yank, instead.) I finally got to see one up close when Felipe Costa visited our gym a few weeks ago. He's sponsored by Kauai and was wearing the black ripstop model. He also had a bunch for sale. So, I picked one up and it has fast become my favorite. The jacket so lightweight that it took up no more room in my suitcase than a dress shirt. Seriously, my belt took up more room. Usually I travel with only one carry-on so, this was a big win. It dries super fast. On this last trip, I was going to train and then straight to the airport. After training, I laid the Gi out on the passenger seat and drove with the window open. In the hour it took me to get to Heathrow, the Gi was dry and I could put it in my suitcase without getting my suits all wet. Bigger win. Performance-wise, the thinner material seems to make getting a grip on the collar easier but, I've been told getting sleeve grips is harder, so I think that balances out. The material is a stretch-resistant cotton-nylon blend that's very comfortable and breathes well. 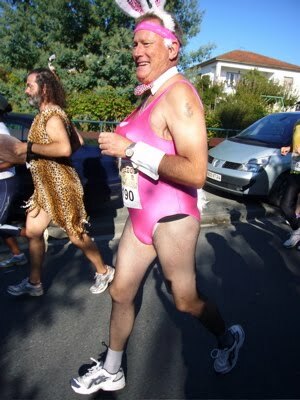 I tend to sweat a lot but, I don't find it to be 'like an Everlast plastic suit' as one reviewer put it. Nor, have I found myself 'chilled in it as it wicked away the sweat so fast'. It's somewhere in the middle of those two. I've only had it a few weeks so, I can't speak to wear-and-tear yet, but ripstop is what they make parachutes and hot air ballons from so, I'm fairly confident it'll stand up over time. If you need a light, low-maintenance Gi that you can pack and go, I recommend the Kauai Kimono.